1st SW PRODUCT -or- POSTER OF ANY KIND! This GENUINE ORIGINAL 1976 Howard Chaykin Star Wars poster has risen to the heights of being one of the most valued and sought after movie posters of all time. That's because it's the very first of all the Star Wars posters and/or products ever produced on the film. Beyond that, this early Howard Chaykin artwork is accredited with establishing the archetype for poster design within the Star Wars universe. 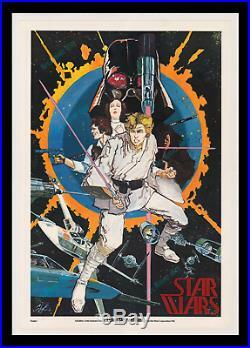 The general structure, as presented on this 1976 lithograph, has become a staple foundation for the design of hundreds - if not thousands - of different Star Wars movie theater and product advertising posters to follow. 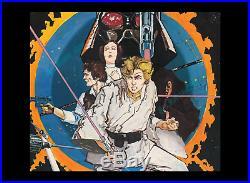 Yes, it's true, this poster is the first (1st) to show Darth Vader and the Death Star looming in the background, and, the characters assembled with their weapons in the foreground, with, space action around the periphery. This basic construction, or a variation thereof, is what we've all come to expect in a Star Wars advertisement. It all started with this poster! The release of it in 1976 also marked the beginning of the campaign to market, or publicize, the film to potential moviegoers. This isn't only "Poster 1" it's Product 1. In my opinion, that's a very BIG deal. THE LAUNCH OF STAR WARS TO THE PUBLIC. Before Star Wars was released, almost a year before the film was finished, George Lucas personally commissioned noted artist Howard Chaykin to render this poster and a new Marvel comic book series based on the Star Wars screenplay. Gary Kurtz, Star Wars producer, and, Howard Chaykin were sent to the Comic Con and the Worldcon Science Fiction conventions in 1976 with a stack of these posters and a flyer to promote the upcoming film. 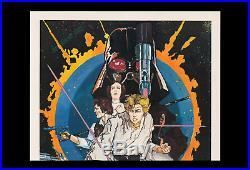 It's been said that there were only 1000 Star Wars Chaykin posters originally printed. More than four decades later, the poster has certainly held it's rarity, and so the limited 1000 piece print-run number is probably an accurate one. The poster was never printed again in any official capacity, and so the only originals were made in 1976. Interestingly, this poster proudly says, "Poster 1" in the bottom left corner as part of its design (see photos #1, 4 and 5). This indicates a series of Star Wars posters to come, but there never was a "Poster 2, " because Lucasfilm a. You have to remember; Star Wars was a completely original cinematic creation. It wasn't a derivative of classic literature, like 2001: A Space Odyssey, and so the general public had no idea what it was about or how impactful the film would become. In other words, the pre-release poster sales bombed! Very few were distributed and most of the ones that were bought got simply pinned-up or taped to walls. Subsequently, finding this poster now, especially in great shape, has become extremely difficult. It's part of the reason as to why it's become recognized today as one of the most sought after Star Wars and/or movie related collectibles on the market. The poster measures approximately 20x29 inches and is in. SOLID C-9 NearMINT ROLLED NEVER-FOLDED ARCHIVAL MUSEUM LINEN-MOUNTED CONDITION. They leave nothing to the imagination. This poster has been perfectly protected since 1976 and has recently been Archivally Museum Linen-mounted to flatten it out and to protect it from damage, so it can be framed properly. It worked like a charm because the poster came out terrific! I used the best conservator in the USA. He ONLY uses high-grade materials, such as thicker linen and thicker acid-free Japanese rice paper. The better materials cost more but make a real difference in the end result. It's flat as a pancake, even flatter, and, it's as nice as can be. A finer Star Wars poster display would be hard to get. Is an accepted form of poster preservation by the Library of Congress and every Museum in the country. A lot of advanced poster buyers request and prefer linen-mounted posters because it makes framing and displaying the posters much easier - without the risk of damaging the original. The white you see in the photos - beyond that of the poster. Is the white of the Japanese paper lining the linen border margin. You can see how easy it would be to damage the original poster without that extra margin of protection. The backing makes the poster much safer to handle - it GREATLY reduces the risk of damaging the original. Also, all of my linen-backed posters have been stored FLAT so they DO NOT have a curl to them - They're all ready for framing and display! ADDED 1976 STAR WARS BONUS! These original flyers are RARE! It's funny, there are less collectors who possess this original flyer than the poster. Very few flyers survived; probably thrown away because they were given out free. It's quite an important early artifact. It was put together by Lucas and "The Star Wars Corporation" NOT 20th Century-Fox and their publicity dept. It has great early information on it. It was CLEARLY made before the completion of the film, as it speaks of elements that were eventually changed. It's an AMAZING read and a must have for any serious Star Wars collector! The Flyer is MINT/NearMINT CONDITION. IF YOU'RE LOOKING FOR A BLOCKBUSTER HOLY GRAIL ITEM ON STAR WARS. Ben Obi-Wan Kenobi Anthony Daniels.... It can crash regardless of any decision you make and can even crash regardless of any decision made by the company related to the stock - Leaving you with a near worthless piece of paper that won't inspire anyone! 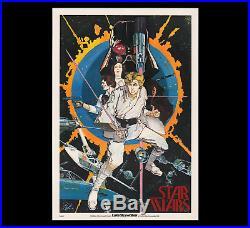 The item "THE VERY 1st STAR WARS MOVIE POSTER OR PRODUCT OF ANY KIND 1976 HOWARD CHAYKIN" is in sale since Sunday, August 19, 2018. This item is in the category "Entertainment Memorabilia\Movie Memorabilia\Posters\Originals-United States\1970-79".miniver" and is located in Studio City, California.